I recently saw a meme that poked fun of making lunches at the beginning of the school year versus the end of the year. The first picture was a perfectly packed lunch using the food items to make houses and people and a sweet little note tucked in the side of the lunch bag. This picture was labelled “packing lunches in August”. The second picture was a couple carrot sticks, some hot sauce packets, and a beef jerky stick thrown into a dirty lunch bag. This picture was labelled “packing lunches in April”. I laughed so hard I cried because this meme is so truthful it hurts! LOL! Whether I’m packing my kids’ lunches or my own lunch for the office, I’m getting burnt out this time of year! But, I’m trying hard to stay the course, and not fall off the bus because packing healthy lunches is important to me and to my family’s health. For adults, did you know that lunch is often our most unhealthy meal of the day? It’s often overlooked which sends us out for lunch or eating from a vending machine. Neither option is healthy, and both are expensive compared to packing your own lunch. I know, you are strapped for time, too busy, burnt out from packing so many lunches during the school year—I have all the same excuses! This is why I’m so grateful for all of the healthy, convenient products found in the Green Bean store. We have a huge selection of products that are individually wrapped or conveniently packaged to make your lunch packing quick, easy, and healthy! Fruits and veggies are one of the cornerstones to any healthy lifestyle! Tossing a piece of fruit into your lunch is about as easy as it gets! Right now, we have delicious kiwis, blackberries, blueberries, and strawberries all coming into season, and when it comes to veggies, baby carrots, mini sweets, mini cucumbers, snap or snow peas, and grape tomatoes are our go-to’s for healthy convenience. Garden Cut offers pre-cut fruit that is super convenient to toss into your lunch. Josie’s Organics has pre-cut veggies like broccoli and cauliflower that pair well with a side of hummus or dipped into one of Cindy’s Kitchen’s dressings. Both Josie’s Organics and Earthbound Farm have super tasty salad kits. Now that it is warmer out, we have been eating more salads and these salad kits have been a lunch packing game changer for us! They have everything you need to make a perfect lunch salad—greens, crunchy toppings, and dressing. My daughter enjoys them in her lunch, too. Since the salad greens are mostly a mix of romaine, cabbage, and kale, the salad stays crisp and fresh and not wilted by the time she eats it at school. Protein is important at each meal. It fills you up and helps to keep you focused. You might already be enjoying our selection of deli meats to make the perfect lunch sandwich, but we have recently added some more convenient lunch time proteins like American Tuna canned tuna—16 grams of protein per serving + a healthy dose of omega-3’s! You can eat it straight out of the can or make a quick tuna salad with a little mayo, a pinch of salt, squeeze of lemon, and a heaping tablespoon of Farmhouse Culture Garlic and Dill Kraut. The smoked rainbow trout from Rushing Waters Fisheries or the smoked salmon from Spence & Co + Zingerman’s Creamery cream cheese added to a bagel or artisan bread and topped with some organic microgreens from Shenandoah Growers is another easy, healthy lunch idea. If you are vegan or vegetarian, the Beyond Meat chicken free strips are an excellent addition to a salad or made into a sandwich—22 grams of protein per serving! If you love dairy like we do, then there is nothing easier than packing cheese sticks, mini yogurts and individual milks into your lunch. 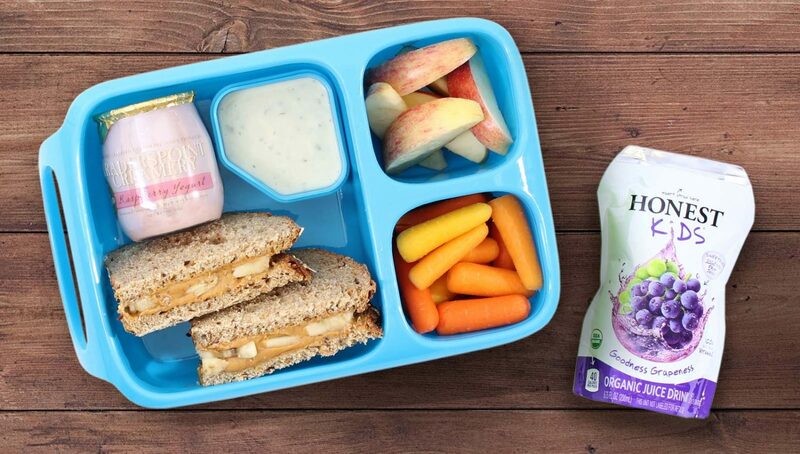 The Noosa Yoghurt 4-packs have been a lunch time favorite for my kids! Well, I’m in love with them too, especially the Mexican Chocolate. The newest flavors to the 4-pack option are the raspberry and blueberry and they are both delicious! My kids are like most kids and obsessed with cheese sticks! We have so many to choose from—Organic Valley, Hartzler Family Dairy, and now Carr Valley Cheese Co. I call Carr Valley’s cheese sticks the grown-up cheese stick! Goat Cheese Cheddar and Fontina are two of their cheese sticks we offer. They are a perfect 1-ounce stick of artisanal cheese that will elevate your lunch game! Nuts and seeds (and their butters) provide a little bit of protein, but more importantly, a good dose of healthy fats which also helps to keep you full and focused. We have a great selection of nut and seed butters to choose from—from your basic peanut butter to the unique hazelnut butter (which is my favorite, by the way). Justin’s Nut Butter has these super convenient nut butter squeeze packets that I love to toss into my kids’ lunches—peanut butter, almond butter, and chocolate hazelnut butter—just tear open and eat with a spoon!